I hope that everyone had a fabulous Thanksgiving with family, friends, and delicious food! I am certainly still recovering from my turkey, dressing, and pecan pie! But mostly, I am grateful to have had a weekend filled with the love of family and traditions of Thanksgiving! One of my favorite parts of the holiday season is its ability to bring loved ones together – whether they are your next door neighbors or your favorite aunts from across the country. Sharing a meal or drinks together in your own home is one of the greatest gifts you can give those closest to you. However, there are so many different styles of parties and formalities of events, it is hard to know where to begin with the planning! For me, there is one cardinal rule of entertaining; make sure that your soiree reflects your personal style. If you begin by planning the event like you would a room design in your house, then you will surely have a beautiful result. Pull from your favorite items – your grandmother’s china, your favorite recycled glassware, or the new tablecloth you selected. Then layer from there. Here are a few tablescapes and special holiday elements that caught my eye. I adore this bountiful harvest table. The rich plum fruits and dark woods add organic elements to the elegant china and silverware. The balance creates a memorable holiday table that has the warmth of the season and could be implemented throughout the year. Although these colors may seem like unusual choices for the holidays, I love the use of a seasonal fruit such as oranges for a centerpiece! You could mix them with magnolia leaves or put cloves in the oranges for added scent! I know, you wish you’d thought of this, too. 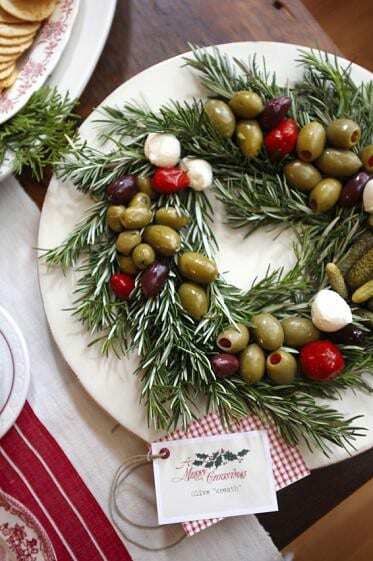 Isn’t that centerpiece/delicious tray of olives stunning? What a special way to dress up simple, slipcovered chairs. You could definitely replicate this look on your own for the holiday season, or add your own spin on it! Maybe you could tie a little gift on the back of the chairs for your guests! Please join us at Nandina Aiken this Thursday, November 29 from 6-9 or at Nandina Atlanta this Friday, November 30 from 6-9 for our annual Holiday Entertaining Open House! At our Martinis and Mistletoe event, you can sip on cocktails and nosh on a delicious assortment of hors d’oeuvres while engaging with our staff and learning terrific holiday entertaining tips that you can integrate into your own holiday event! Also, shop our lovely holiday showroom and enjoy 20% off all gifts, accessories, and holiday decor! We look forward to seeing you this week!